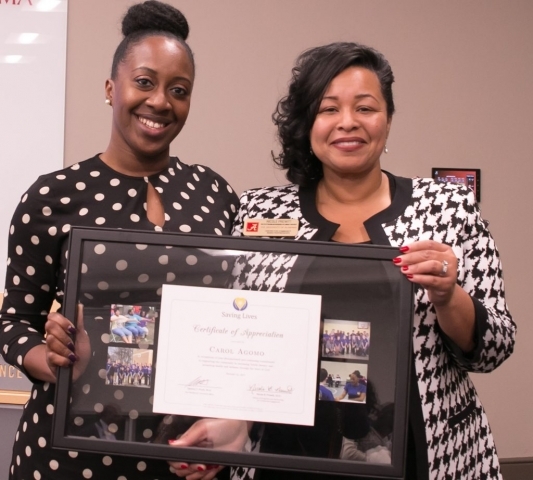 At a year-ending appreciation dinner on December 14, 2017, the Center for Community-Based Partnerships (CCBP) and its Saving Lives community partners concluded another successful year and discussed future initiatives, according to Dr. Nicole B. Prewitt, CCBP director of programs and partnerships for community engagement. 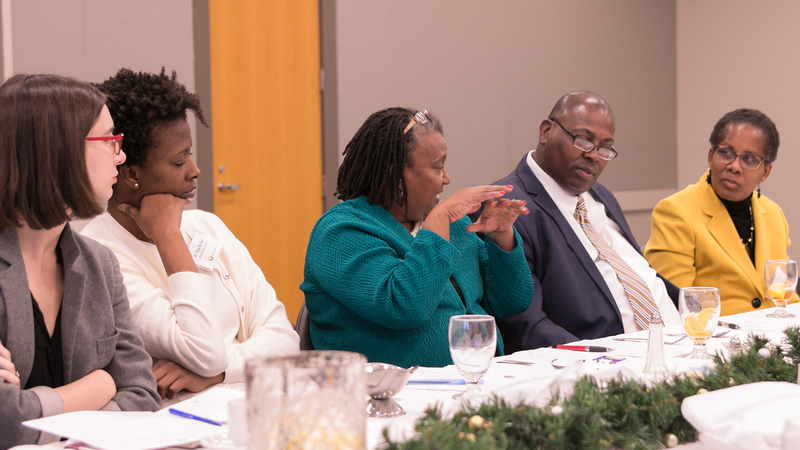 About 25 University and community members attended the dinner at the Bryant Conference Center. Prewitt, who has an Ed.D. in adult, higher and community education from Ball State University, joined the Division of Community Affairs in the fall of 2017. 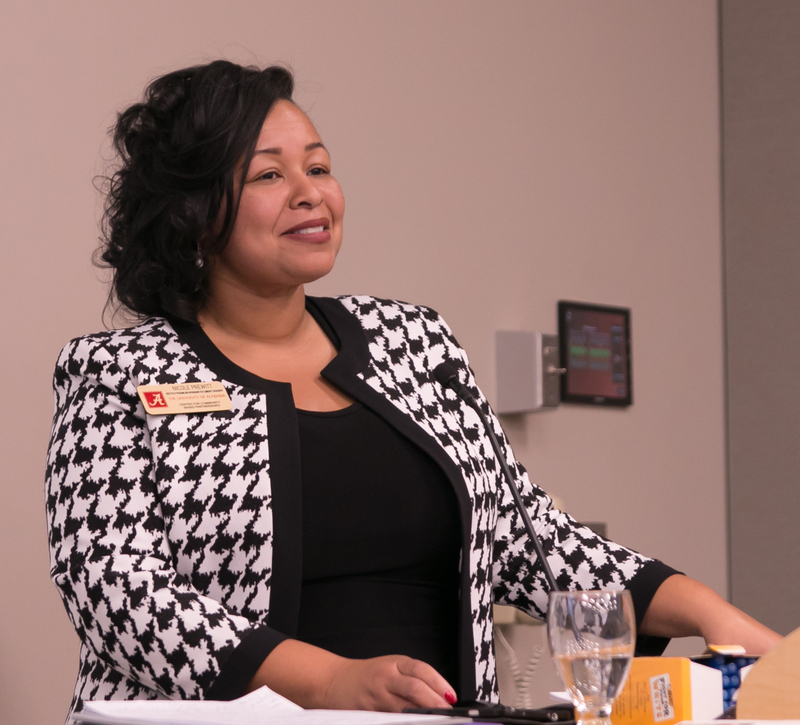 She brings with her a background in higher education, including serving as dean of Instructional and Student Services at J.F. Drake State Community and Technical College. Prewitt also is active in community engagement and local church ministry in the Macedonia CME Church in Greene County and the Martin Mission CME Church in Hale County. Since 2012, Saving Lives has worked with an increasing number of local churches to promote various health related events such as health screenings, cooking demonstrations, and workshops for the mind, body and spirit. Until Prewitt joined the division, Carol Agomo, director of community and administrative affairs, led the Saving Lives program. At the appreciation dinner, Agomo offered this review of the program: “As I look at what we have accomplished over the past five years, we have advanced the Saving Lives trilogy to provide health-related information, increase knowledge about healthier eating, and promote healthier physical activities.” Agomo was awarded a certificate of appreciation for her work with the organization. Prewitt offered her conceptualization of how churches participating in the new Saving Lives Academy would receive support for semi-annual health screenings, church health profiles, health-expert speakers, and instruction in health education. In addition to these resources, the Saving Lives Academy will also provide quarterly training modules. In return, the designated churches would be responsible for conducting three distinct health related activities throughout the year; preparing monthly activity reports; and recruiting new churches to join the Saving Lives Academy. The dinner meeting concluded with an evaluation activity designed not only to provide feedback about what Savings Lives Academy currently means to the community but also to provide ideas for its future. The next steps in establishing the design and purpose of the Saving Lives Academy include the establishment of an advisory group in early 2018, which will include the participants at the dinner and members of the pioneering Saving Lives churches.